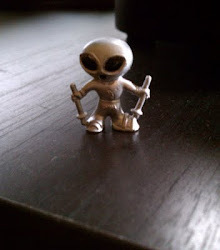 High Strangeness: Happy Anniversary, UFOs! Looking back from 67 years later it's hard for us to appreciate just how significant Arnold's sighting actually was. Humans had been seeing weird things in the sky for years, of course, so in one sense this was nothing new. But the mystery "airships" of the late 19th century were clearly held aloft by terrestrial technology; Arnold's saucers had no wings, no tails, and no visible means of propulsion -- what the hell were they? A little over six months later, the Air Force got into the UFO game with "Project Sign," and in due course the Sign investigators took a look at Arnold's report. When my man J. Allen Hynek reviewed the file, he came up with "certain inconsistencies" in Arnold’s estimates of size, speed and performance of his "saucers," according to a Project Sign memorandum. 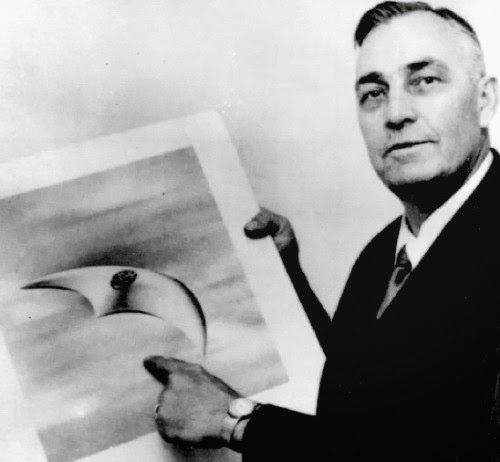 Kenneth Arnold, and an artist's conception of the first flying saucer. Although he allowed that he couldn't explain the incident away as "sheer nonsense," Hynek contended in his report to Project Sign that the reflections of sunlight on the strange objects that first caught Arnold's eye were troubling. 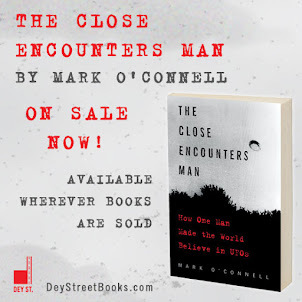 "For a direct reflection, the angle between the observer, sun and object must 'just right,'" he wrote, "and at such distances of 20 to 25 miles, the chance of a series of direct reflections is extremely small." For Arnold to have noticed the objects as a result of direct reflections, Hynek reasoned, the objects had to be either far closer than 20-25 miles, or they had to be extraordinarily huge, perhaps 100 feet in height. It followed that if Arnold's estimates of the objects' distance and size were in question, then so was his staggering estimate of their speed. "In view of the above," Hynek reported, "it appears that whatever objects were observed were traveling at sub-sonic speeds and may, therefore, have been some sort of known craft." Fifteen UFOs and 35 Head of Cattle!